PaintCare Inc. Maine - PaintCare Inc.
PaintCare plans special, one-day paint drop-off events in some parts of Maine. These events are open to households and businesses (painting contractors, property managers, etc.) in the state. It’s more convenient than ever to recycle paint in Maine. Since the start of the Maine paint stewardship program in October 2015, PaintCare has set up 118 convenient locations to drop off paint throughout the state. Most of these sites are at paint retailers (paint, hardware, and home improvement stores) that have volunteered to take back paint, and they are available to any household and business in Maine. These stores accept paint whenever they are open for business. A number of PaintCare drop-off sites include household hazardous waste programs — either facilities or “round-up events.” These programs are run by a local county or city government agencies, often in partnership with the local garbage and recycling company or transfer station. In addition to accepting paint, these programs usually accept other non-paint hazardous wastes (e.g., pesticides, solvents). Most of these government programs limit participation to the households in certain cities or towns. Some of these government programs also allow businesses to make appointments during special hours. Businesses are usually charged fees for non-paint hazardous waste, and sometimes they are charged an administrative fee to schedule an appointment, but they are not charged for paint, on a per gallon basis, if the agency is a PaintCare partner. A few restrictions do apply: there are limits on how much paint can be dropped off per visit. Also, note that certain businesses — those that produce more than 220 pounds (about 20-30 gallons) of hazardous waste per month — can only drop off latex paint (they are not be able drop off oil-based paint). When you decide it’s time to recycle your paint, please call the site ahead of time to confirm their hours and to make sure they have space to accept the amount of paint you would like to recycle. PaintCare sites accept house paint, primers, stains, sealers, and clear coatings (e.g., shellac and varnish), but do not accept aerosols (spray cans), solvents, and products intended for industrial or non-architectural use. The products we can accept are referred to as “PaintCare Products” or “architectural paint,” and they must be in containers that are no larger than 5 gallons in size. Paint must be in its original container and the container must have an original label and a secured lid. We cannot accept open or leaking cans. Please review the following detailed list to find out what can be accepted, prior to dropping off your paint. There is no charge for dropping off paint at a PaintCare drop-off site. PaintCare is funded by the “PaintCare Fee” which is added to the purchase price of paint sold in the state. These fees are paid to PaintCare by paint manufacturers, then passed down to retailers and to their customers. When you buy paint, you may see a line item on your receipt or invoice for each container. The fee is not a deposit — you don’t get it back when you drop off paint — a common misunderstanding. Effective December 1, 2018, sales tax is not applied to the PaintCare fee in Maine. These fees are used to fund all aspects of the paint stewardship program. Fees pay for paint collection, transportation, recycling, public outreach, and program administration, and to manage old “legacy” paint — the paint that has been accumulating in homes and businesses from before the program started. PaintCare sites accept old paint, even if it is 30 or more years old! The fees are based on container size as shown in the table below. PaintCare’s program brochure is intended for the general public. To request free paper copies of this brochure for you or others, please contact us at 855-PAINT09. In addition to paint stores, other organizations (e.g., government agencies, real estate agents, property managers, painting contractors) are welcome to order brochures and distribute to others. As required by state law, a paint stewardship assessment (“PaintCare Fee”) must be added by manufacturers to the wholesale price of all architectural paint sold in the state. This fee is paid by manufacturers to PaintCare to fund setting up drop-off sites for leftover, postconsumer paint, and for the transportation, recycling, and proper disposal of that paint. The fees also pay for consumer education and program administrative costs. Effective December 1, 2018, sales tax is not applied to the PaintCare fee in Maine. Retail drop-off sites provide a convenient and no cost recycling option for painting contractors and other businesses. Businesses that generate less than 220 pounds of hazardous waste* per month are able to use these sites to recycle all program products (both water and oil-based) with some restrictions on quantities per month. Larger businesses (those that generate more than 220 pounds of hazardous waste per month) may use the drop-off sites for their water-based program products only; they are not able to use the sites for oil-based paint or other solvent-based products. If you have a large amount of unwanted paint, PaintCare offers a service that benefits both you and our volunteer drop-off sites — you don’t have to take your paint to a drop-off site a little at a time, and they don’t get overwhelmed with large volumes of paint. This free service is available to households or businesses with at least 200 gallons of paint. To learn more, please review the following fact sheet. Then call PaintCare to request an appointment. Information for painting contractors is available below. a. Employee training logs for the PaintCare program. Download training log here. b. Shipping documents provided to the retailer by PaintCare’s contracted transporter. b. Sell Registered Brands: Retailers must make sure they do not sell unregistered architectural paint brands. Retailers can verify the registration of manufacturers and brands using the following lists which are updated regularly. If you are a retailer and do not see a manufacturer or brand of paint sold in your store on these lists, please contact PaintCare at (855) 724-6809 so we can contact them to help get them registered. c. Provide information to consumers about the paint stewardship program and recycling opportunities in Maine. PaintCare has developed the General Poster and Program Brochure to help retailers meet this requirement. See ordering information below. PaintCare held a series of online Webinars on May 12 and June 16, 2015. These Webinars discussed Maine’s Paint Stewardship Law and the role of paint retailers. To view slides from these presentations click here. Fact Sheet: Paint Retailers. This document explains how the paint stewardship program affects retailers and what is required of retailers according to the paint stewardship law. Fact Sheet: PaintCare Fees. Answers to common questions from retailers about fees. Fact Sheet: Painting Contractor. This document is helpful for retailers to explain the program to their customers who are painting contractors in advance of the program so that they can be prepared to incorporate fees into future job estimates. Also available in Spanish. 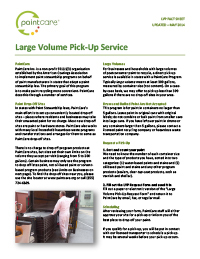 Fact Sheet: Large Volume Pick-Up Service, available in Spanish. Brochures and other printed materials are available to retailers and facilities at no charge. Order additional materials online, or place an order by calling PaintCare at (855) 724-6809 or by sending a completed form by email, fax, or regular mail. General Poster for Retailers This poster is intended for use in stores in the paint department or near the cash registers to help explain the PaintCare program and Fees to customers. Retailers may volunteer to be a paint drop-off site and accept paint from households and certain businesses in their community. To learn more about what is involved in becoming a drop-off site, please read the above fact sheet. If you would like to be a drop-off site, please fill out our Online Retailer Interest Form (or use the Word or PDF version and send by email, fax or regular mail). 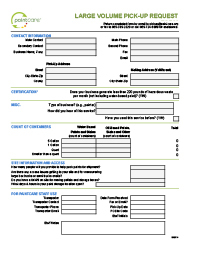 Fact Sheet for HHW Programs, If you would like to partner with PaintCare, please fill out our Online HHW Interest Form (or use the Word or PDF version and send by email, fax or regular mail). Fact Sheet for Transfer Stations and Recycling Centers. If you would like to partner with PaintCare, please fill out our Online Interest Form (or use the Word or PDF version and send by email, fax or regular mail). PaintCare encourages household hazardous waste programs, reuse stores and others to operate paint reuse programs (i.e., swap shops or exchanges). Reuse programs return good quality unused paint to the local community at low or no cost. Reuse is a preferred method of waste management. To encourage reuse, PaintCare compensates paint drop-off sites operating a reuse program under a contract with PaintCare. PaintCare allows two different reporting methods by container or by volume as described here. This one-page infographic (8.5″x11″) highlights the successes from the most recent reporting period for the Maine PaintCare Program (July 2017 to June 2018). Please consider downloading and printing a copy of the infographic and then posting it for staff and the public at your business or organization. PaintCare prepares an annual report for the 12 months ending June 30. The first report for Maine covers 9 months because the program started in October 2015. On January 17, 2019, PaintCare hosted a public webinar to review the most recent Annual Reports for its programs in Connecticut, Maine, Rhode Island, and Vermont, and provide an update on program activities. A recording of the webinar is available here. Effective December 1, 2018, sales tax is not applied to the PaintCare Fee in Maine. To review the law that exempts the fee from sales and use tax, visit the Maine State Legislature’s website. The Maine Paint Stewardship Law requires retailers of paint to include the PaintCare Fee in the sale price of program products and only sell products registered with the program. These fees are used to fund all aspects of the paint stewardship program: paint collection, transportation, recycling, public outreach, and program administration. 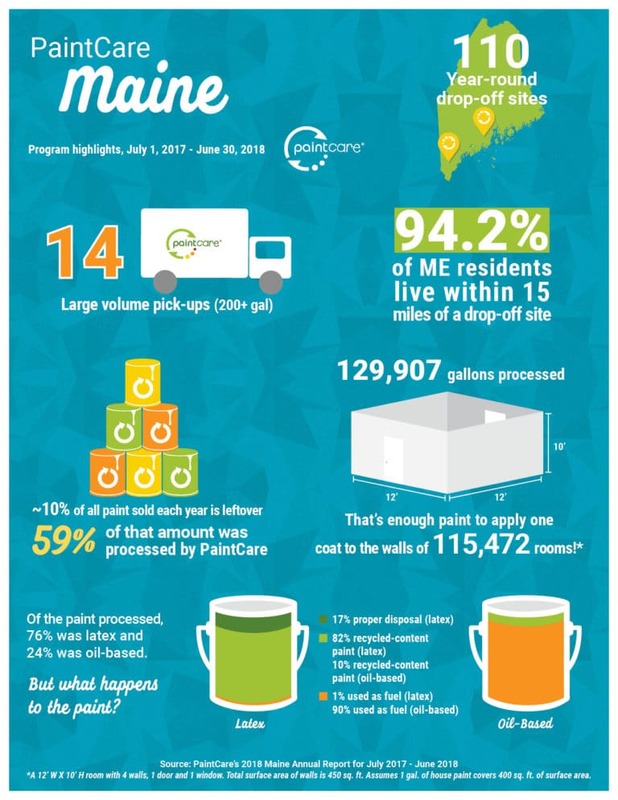 PaintCare’s program plan for Maine was approved in August 2015. this plan describes the operations, outreach, and other activities proposed for the Maine Paint Stewardship Program. The Maine paint stewardship program is required by the Maine Paint Product Stewardship Law (July 2, 2013). The oversight agency for the Maine paint stewardship program is the Maine Department of Environmental Protection.